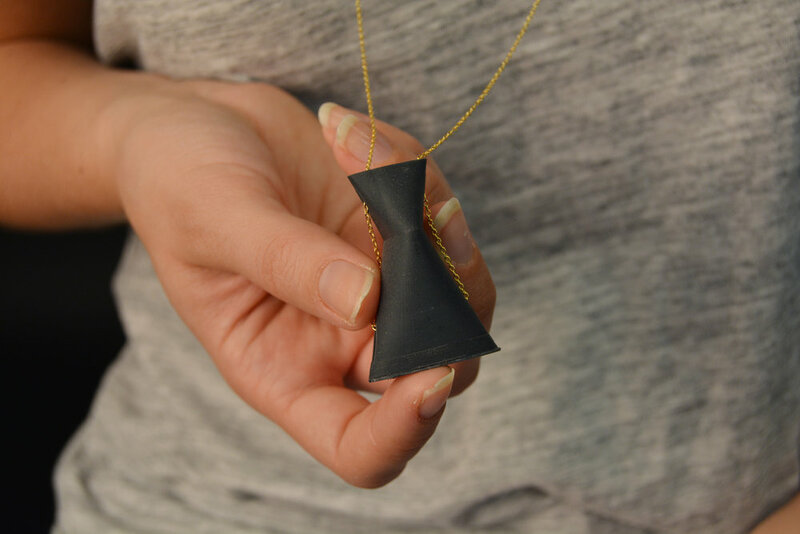 The goal of this project was to make a family of necklaces that were designed to be printed on the Formlabs Form 2 SLA 3D printer. 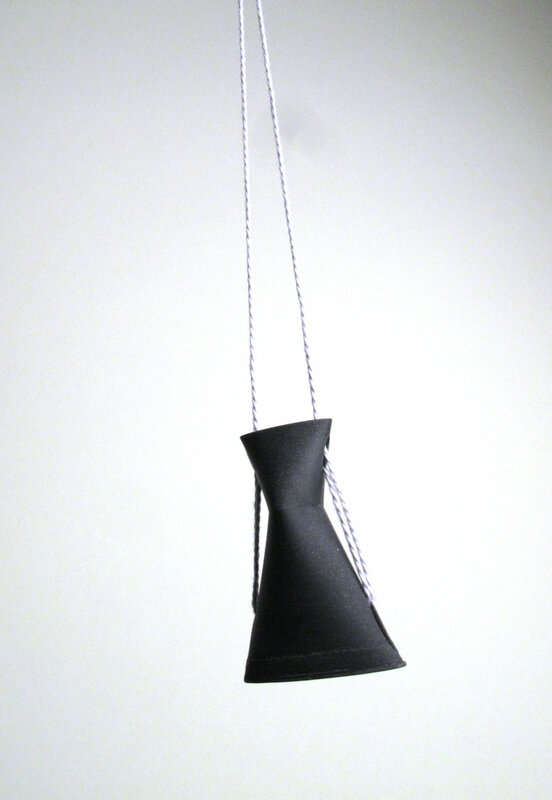 I sold the necklace pictured above at a silent auction at the Society for Contemporary Craft in Pittsburgh, PA. Since then, I've been developing the designs and experimenting with new materials like string and metal accents. I enjoy exploring added details with materials like string and metal accents to incorporate color and contrasting textures. 3D printing is a tool that I always return to as a designer. This time, I wanted to create a print that was virtually complete (no need for sanding or paint) once the last layer is printed. The 3D printing process creates a distinct aesthetic (visible digitally created layers), and I wanted to highlight that feature and make it beautiful for the wearer. The form was inspired by the prints used for my modular lamp. Images of the Formlabs Form 2 SLA printer, including the time counter for a group of my prints. 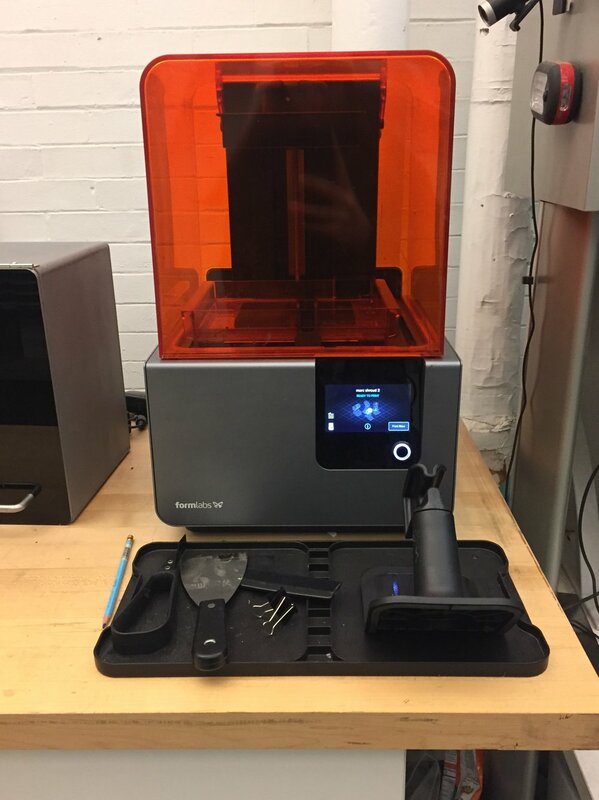 I spent a significant amount of time in Autodesk Fusion 360 as well as PreForm (Formlabs Software), analyzing the potential risk of error and chance of success with the help of 3D Lab technician at CMU, Josiah Stadelmeier. The images on the right are taken from PreForm as I arranged the prints and the supports that line the bottom of each piece. The consistency of the supports is critical to the final print. In addition to the Form2 resin printer, I also experimented with filament printers. Even with the smallest layer (z) height, the print consistently had ridges and hiccups. Many CAD files and test prints were made to refine the form in order to make it appropriate and comfortable as jewelry. The pendants were printed in a group to save time and reduce cost (pictured above). A line of my 3D printed necklaces was on display at the show Assemblage at the Miller Gallery at Carnegie Mellon University. The show was an exhibition for my senior class at the School of Design. If you're interested in purchasing a necklace, please contact me directly via email for pricing and to talk about custom designs. Both necklaces pictured below are currently for sale.